How much time have you spent smelling roses this spring? They don’t all smell the same, but some have so much waft, like the Ispahan, it’s heaven. But then they fade and frazzle in the summer heat. I have a bit of an obsession with them at the moment, if they’re in syrup and preserve form at least. I seem to want everything to be rose-flavoured, let alone rose-tinted. The first encounter I had with a sublime rose preserve was on a spoon in Lebanon at the beginning of May. Talk about heavenly mmmmmmness. And for once, rather than leave it as an ornament in the cupboard as I tend to do with precious ingredients, I’ve put my jar of pale pink petals encased in syrupy jelly to work pretty quick. It’s even featured in the first post. So I couldn’t not use it in a smoothie for the Cuisinart Food Blogger Connect 2011 ticket giveaway. Cuisinart has been generous enough to provide not one but two people with the chance to have a ticket to the 2011 event this August, even if they’re already registered. FBC is in its third year and will be welcoming food bloggers not just from the UK and Europe, but worldwide. Including me. I went blogless last year but went home with loads of tips, advice and ideas that have taken more than a year to shape into something. Cuisinart is teaming up with celebrity chef Anjum Anand by providing the blenders and grill she’ll be using to give a video cookery demonstration, with an opportunity for someone to take part too. Plus another lucky person at the conference will take away a Cuisinart Elite 3.8l food processor. I’d use fresh litchies (or monkey balls as my nephew likes to call them) if they were in season, but it’s summer not Christmas so only tinned are available. The grapes would be better peeled, but although I do actually have a grape peeler in my gadget collection, it is yet to be used. 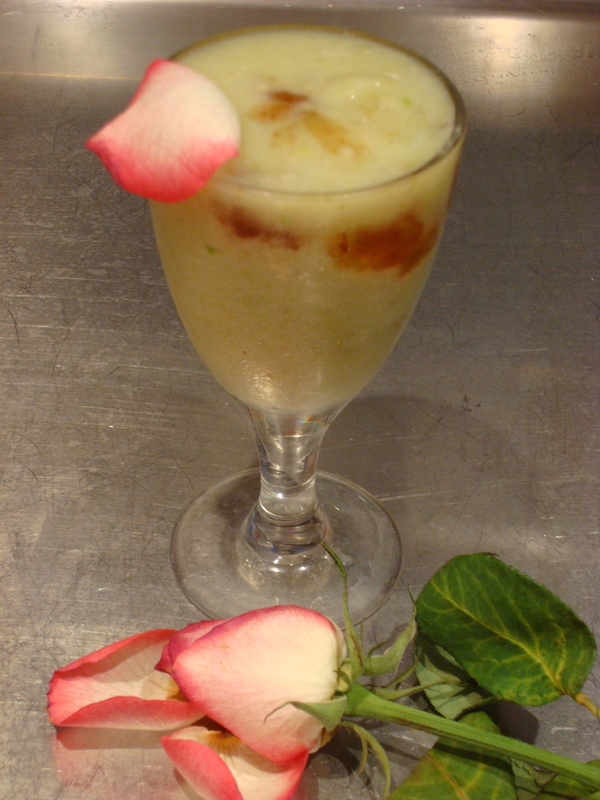 And the result is a very pale green, with a hint of pink from the rose preserves, and incredibly refreshing. Freeze the litchies and for at least 4 hours before you want to use them. Blitz the litchies and grapes in a blender, starting on the ice crush level. Stir in a good 2 tbspns of rose syrup, and the glass of water. Drape with a spoon of rose preserve. This entry was posted in Smoothies and tagged Anjum Anand, Cuisinart, FBC, grape, litchi, rose, smoothie. Bookmark the permalink.